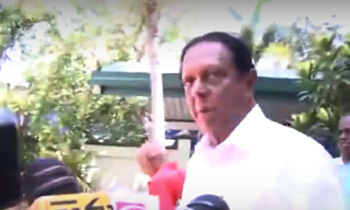 Furious over the questions asked by some journalists regarding garbage disposal at Bopitiya in Wattala, Minister John Amaratunga is is reported to have threatened them with death while leaving the party office in Kandana today. According to some journalists who had videoed the entire episode, the minister had turned furious asked the journalists to leave the vicinity when they told the minister that the people were blaming him for the garbage crisis at Bopitya. “I am the person who shifted it here from there. Do not report false news. Otherwise, I will beat you all to death,” he told the journalists. Despite the journalists attempting to explain the matter to the Minister, he repeatedly accused them of reporting false news and forced them to leave. “Get lost," he said using unprintable words. "Just see the questions they are asking. If you do not know the facts it is better not to ask. We are the ones who have stopped it,” he said. When the journalists said they were only conveying what the people were saying, the minister said these journalists need not teach him about people’s views. “You don’t try to teach me. I know it. Do not come through this gate hereafter. Please... It is enough now. Leave... you just leave!” he threatened. The minister who was approaching the journalists in a threatening manner was calmed down by those near him. “Do not make me a bad person by publishing false news,” the angry minister said. Come on guys, why so much of noise when a minister makes a verbal threat, haven't you forgotten the type of threats you had during the previous regime which were much more dreadful than something like this? He is playing the court jesters role in this government which was initially portrayed by Mervin Silva and A J Ranasinghe . So appalling to note that Gampaha District public is voting for such mediocre politicians . Intoxicated with power. Remember more powerful politicians have fallen and suffer today to the hilt. He is filling the void left my Mervyn Silva. This is the death cry of a regime that has failed so miserably to fulfill the aspirations of the people who elected them. If the people vote in uneducated politicians and expect them to solve their problems this is what you will get...When criticized this man cant take it because he knows nothing on how to remedy the problem...these kind of politicians will only create more problems. the people must demand that these useless politicians in all parties resign from politics for the good of the country. But thats not what they promised when they asked for power no. Thiyana loku kama!Tax gevan minissungen padi aran boru part danawa!Mehema nondi karalama danna oni! We really miss the former regime. No such questions would be asked to begin with. Shows how weak the govt. Is. Threats from a dead snake. I wonder why this politician is still around? You can change governments but you can't change politicians. What a shame! Time to call it a day John, you are too old and crotchety for this now. Go home and enjoy your retirement! this is is exactly typical party politics perspective. when something went wrong it is compared with the previous regime and justify it saying that same mistake was done by previous regime so dont make a big deal out of it. kawada merata godayaida ithin. THIS IS NOT A BEHAVIOR OF A TRUE CHRISTIAN. Relax guys! This is the side effects of the tablets he took some time ago!! This one is a shame not only to the Party but to the whole country. He is only fit to be a Kunukasala Supervisor! Must be after effects of an overdose. I am trying to imagine how the reaction would have been if the journalist was a female. How can I disagree with you Gayan? John must learn a lesson from Mervyn, because the nature of repercussions over threatening the media never changes! Getting some tips from his idol, the former king.